A breakout session at the 2018 STN EXPO facilitated a conversation on lap/shoulder school bus seat belts, while three student transporters shared their real-life challenges and benefits associated with the occupant restraints. 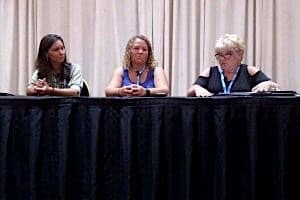 (Left to right) Student transporters Jerri Levy, Saundra Keister and Lisa Wheeler shared their experiences with lap/shoulder seat belts on school buses at the 2018 STN EXPO. The July 15 afternoon panel at the Peppermill Casino Resort Spa in Reno, Nevada was led by School Transportation News Editor-in-Chief Ryan Gray and featured school bus driver Saundra Keister and driver trainer Jerri Levy of California’s Fremont Unified School District near San Francisco, as well as Lisa Wheeler, safety coordinator with Bartholomew Consolidated School Corporation in Columbus, Indiana. 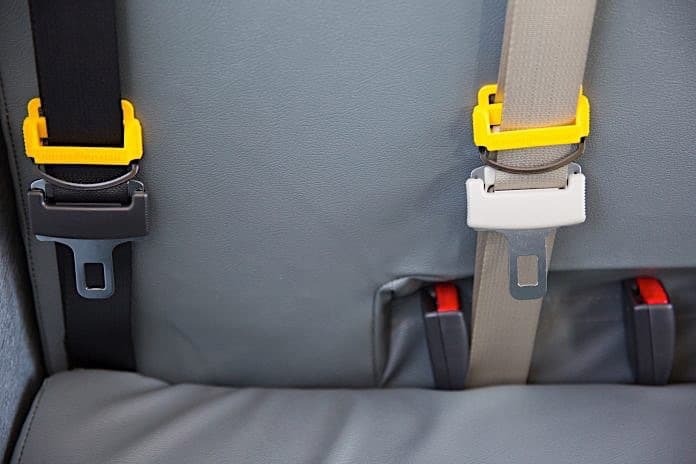 Lap/shoulder seat belts vaulted to the forefront of school bus safety conversations following the deadly school bus crash in Paramus, N.J., on May 17, and the NTSB report released five days later that recommended all states mandate the three-point belt systems on all school buses, to help mitigate tragedies like the November 2016 fatal crashes in Baltimore and Chattanooga, Tennessee. Levy said she agrees with lap/shoulder belt mandates, since “the pros outweigh the cons when it comes to safety.” Wheeler supported this by revealing that BCSC has had minor crashes, and observed video surveillance of how the seat belts keep the students in their seats. “It’s a totally different outcome when they’re in their seat belts versus when they’re not,” she shared. To illustrate this point, Gray recapped an IMMI/SafeGuard crash test conducted last year, during which one unbelted student dummy flew across the aisle, hit its head on the window frame and was ejected out the window to land on the concrete. One attendee said that he was anti-seat belt until a rollover crash he experienced about two years ago, when two unbelted aides suffered the most serious injuries and were rendered unable to assist students with the evacuation. In contrast, a larger wheelchair-bound student ended up on the high side of the bus, but was secured safely. The NTSB found in its May 22 report that three-point belts would have helped in the Chattanooga crash by keeping students in their seats and preventing them from being thrown into the zone where a tree truck crushed part of the school bus roof in. “[Students] need to know how to get themselves off the bus,” Wheeler said. She added it’s also good to consider teaching older or capable students to stop the bus, a point that echoed advice given in a school bus security general session earlier that morning. Although training may be counter-intuitive or scary to students, it must be carried out, said Levy. Continued coaching and practice builds familiarity and readies them for a potential emergency. Keister said she instructs older students to assist younger ones and has seat belt cutters to help. She and Levy said it is important to train students to leave their belongings and help each other, in order to ready them for situations in which the driver is incapacitated. A number of attendees indicated they were concerned seat belts would interfere with evacuation efforts in the event of an emergency or fire, though there have been no crashes in which lap/shoulder belts were recorded as playing a negative role. Levy said she handles seat belt training like any other emergency equipment, and trains on different fire and evacuation scenarios. She hasn’t had drivers express concern about being able to get everyone out, mainly due to all of the education of students and community. Sometimes drivers are opposed to lap/shoulder belts for more personal reasons. With some, “it’s more about the inconvenience to the driver than it is to the students,” stated Keister. Levy also said that some of her drivers don’t want seat belt buses, because they can save time in getting on the road, but others request the seat belt buses in an effort to reduce student behavioral problems. Wheeler shared that the transportation director who is responsible for implementing the belts at BCSC, Monica Coburn, received feedback from skeptical drivers who later admitted that the belts helped with discipline and keeping students in their seats. Seat belt usage policies were added to the student handbook and information was sent to parents. “Try it” and it might grow on you, advised Wheeler, as it did on one of her most adamantly protesting drivers. Follow through is also crucial. Keister said she takes the hard stance and refuses to drive unless students’ seat belts are fastened. Negative parental attitudes can also be a challenge. Parents may be annoyed their children have to ride a bus with belts. But Levy noted that some of those students were in fact reprimanded or suspended for repeatedly refusing to wear them. Wheeler said she deals with parents who are angry with a “silly” reprimand for their child not wearing their belt. Wheeler and Levy stressed the need for cooperation from district officials on discipline for students who don’t wear the belts. They both said they have found older students to be the least likely to follow directions and wear the belts. A usage policy, constant training and daily direction from drivers are best practices that help districts avoid liability issues. “It doesn’t take much time to put them on. Students have a responsibility to use them after they’ve been told to do so by the driver,” Wheeler said. BCSC also has yearly drills with emergency personnel who bring equipment and train on a school bus to assess the best way to get students off. “If they don’t come in and train with you then they have no idea,” Wheeler explained. Seating charts help first responders get an accurate count of students on a bus because they are able to look for students assigned to each seat, rather than forcing them to check under each and every seat. All of this is not to say that there are no challenges to seat belts on school buses. In answer to an attendee question, Levy confirmed that having just one seat belt that doesn’t work will put a bus out of commission. The issue of students using seat belts as weapons against other bus passengers is not one Levy or Keister have observed, though they noted that some special needs students will hit them against the windows. Although three-two seating helps assuage concerns over loss of capacity, Keister said as a driver she does understand concerns with trying to fit three larger students into one seat. Larger students or students with backpacks on will often end up in the aisle. This, however, is a basic safety concern that may have to be addressed, whether or not the bus has seat belts, Levy said. For example, in California, nothing is allowed to block the aisle, so capacity could be lost if the third child on a seat needed to move. “When we have the belts, we want you to wear them for safety—not comfort,” declared Wheeler. Levy agreed, though she noted that even while students are getting bigger and special needs students must sometimes be more spread out, it’s still worth it to be uncomfortable or lose capacity for the sake of security. One Headstart attendee stated that bus fires did concern him. Gray addressed this by providing a reminder that evacuation drills with the five-point harnesses that preschoolers are required to wear require the use of cutters, an area that NHTSA covers in its half-day hands-on training session held every year, both at the STN EXPO and the Transporting Students with Disabilities and Special Needs Conference. “Don’t knock it before you try it,” said Levy. The 10-year student transportation veteran stated that she would rather drive a special needs bus with seven-point harnesses than a bus without any seat belts.